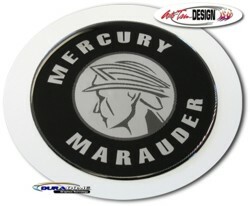 Detail your Mercury Marauder with these awesome "Polyurethane Domed" gems made in Chrome Foil with Black and Grey DuraCOLOR print. Gems/roundels provided are close to the same size as the existing Mercury emblems found on the front grille and rear trunk lid. "Domed" decals are not just vinyl decals. They are a tactile, three (3) dimensional decal that looks like a factory manufactured emblem. They look Fantastic! You are provided with a set of two (2) gems/roundels. Easy to follow general online application and care instructions are included. If you choose to use these gems in place of your Mercury emblems, removal of the existing emblems is required.